Before jumping into waist training, it’s wise to educate yourself about best practices and proper expectations. Waist training involves wearing a corset to slim your waist and achieve that “hourglass” figure. The web is littered with advice and commentary on waist training (some good, most bad). We’ve talked with quite literally thousands of women over the last 10 years who have tried waist training. Based on their feedback and our own experiences, we put together this thorough list of the 9 pros, and 8 cons, of waist training. Have a question we don’t address here? Comment at the bottom and we’ll respond promptly. An “Hourglass” Figure: This is why most women start waist training. The reason: It works. Corsets “cinch” in the waist and accentuate the curves of the bustline and hips. The degree to which your waistline shrinks depends on a number of factors. We recommend checking out this before and after gallery to see results other women have experienced. Improves Posture: Wearing a corset forces you to maintain good posture both while sitting and standing. The steel boning in the corest is rigid, and doesn’t allow for slouching. Improves Confidence: This definitely depends on your personality, but we hear from women all the time who have received an immediate confidence boost when they put on their corset and saw their waistline change. Fashion Statement: It’s more common to waist train by wearing a corset or waist cincher under your clothes (stealthing), but many women simply like the way corsets fit with their style and outfits (see some playful examples). This makes it easier to waist train by simply incorporating the corset as an outfit accessory. Weight Loss: If you wear your corset during meal times (as many full-time waist trainers do), you will find you cannot eat large portions of food. So yes, you can lose weight if you choose to corset for long periods of time (especially before and during meal times). That said, just wearing the corset won’t help you lose weight. Corsets don’t magically melt body fat … they simply help limit food consumption when worn during a meal. See also The Corset Diet: Fact or Fiction. Support the Bustline: Corsets, especially overbust corsets, help support the bustline. This can be a big benefit for women with larger breasts (even helping alleviate back pressure and pain). Pain Relief & Rehab: We know some women who wear corsets for pain relief and support after back injuries. One of our customers, Teresa Panez, uses a corset as part of her rehab program after a car accident. Read Teresa’s story. Another, Hannah, wears hers for pain relief from scoliosis. Postpartum Waist Strengthening & Tightening: Many women waist train to more quickly return to their natural waist size after having a baby. Here’s a helpful blog and video on the topic. We also know of at least one women who found waist training helped with her postpartum depression. Follow along with another as she documents her postpartum waist training journey. For a more extensive list of waist training “pros” see these exhaustive lists of physical and emotional benefits of waist training from our friend Lucy at Lucy’s Corsetry. You’ll find plenty of critics who talk about how dangerous wearing a corset can be, or how waist training may end civilization as we know it (not really but it feels that way sometimes!). We’re poking a little fun at the media and their tendency to want to only report on the extremes here, but the truth is it’s actually safe to wear a corset AND even to waist train without damaging your body. The key with waist training is not to take it to extremes. We suggest “safe and sane” methods of waist training. It goes a little something like this: Is your corset causing you pain? If the answer is a resounding “YES!”, then loosen the darn thing or take it off completely! Your movement is severely restricted. You feel downward pressure on your pelvic floor. Visible Under Clothing: Corsets were designed during an era when women’s clothing fit very differently than it does today. If you’re trying to go “stealth” (waist training without anyone noticing), make sure you pick the right style corset – mesh or satin work best – and wear the right type of clothes. The sheerest corset in the world won’t conceal completely under certain clothing. Lightweight knits and ultra fitted (thinner) blouses and dresses are very difficult to disguise anything under. We have a video that walks you through several outfit ideas. Dresses and skirts often work well, as the waist of the garment usually sits at your natural waist. Ruched tops, ruffles, and thicker fabrics really help to hide any corset bumps as well. Can Get Hot / Uncomfortable on Warm Days: This is a frequent comment. Again, wearing a corset is like adding another layer of clothing. On hot days you’ll definitely feel the sweat if wearing a thicker leather or cotton corset. We recommend a mesh corset, which will be much more comfortable when waist training during the warmer months. Acid Reflux: Your esophagus, stomach, and intestines form an intricate network in your abdomen, and extreme compression from a corset can hinder proper digestion and cause acid reflux. Don’t wear it this tight or simply remove at mealtimes. 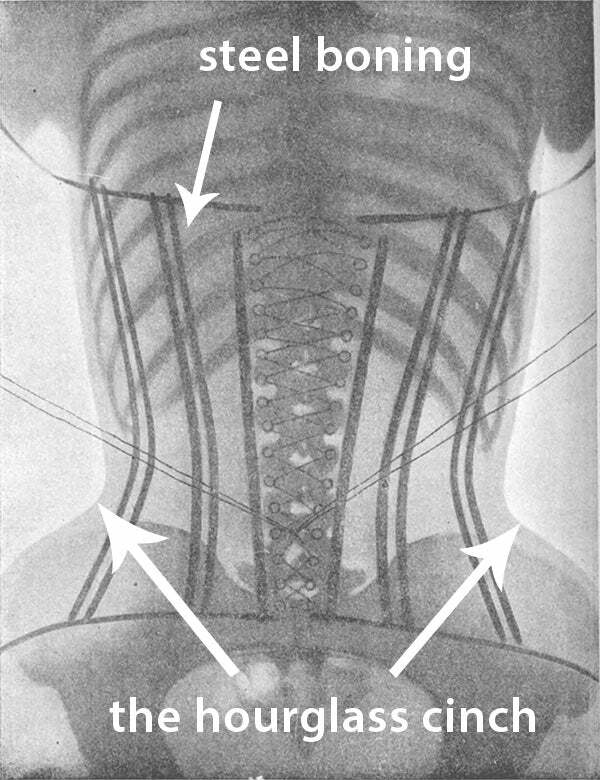 Shallow Breathing: The result of a corset or waist cincher that is too tight, restricting the diaphragm and forces short, shallow breaths (costal breathing). This is similar to pregnancy when the growing baby does the same thing-from the inside. Don’t tighten to this point! Decreases Your Core Strength: This is a definite possibility if you waist train to the extreme (see Cathie Jung), as your core muscles rely too much on the extra support offered by the corset. It Can be Addictive: This depends a great deal on personality, but some women can become obsessed with the ever shrinking waist and take waist training to unhealthy extremes.